Subway passengers walk at the Dostoyevskaya metro station in Moscow. 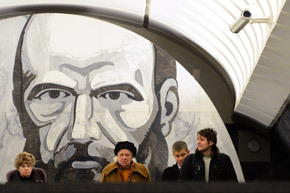 A portrait of Fyodor Dostoyevsky, one of the highly regarded Russian writers, is seen in the background. Source: AFP/East News.